Initially, CSY contracted with other boatbuilders for the manufacture of their vessels, not for private sale, but for use in their company-owned charter business in the Caribbean. After several unsuccessful attempts to obtain a properly constructed yacht from subcontractors, founder Jack Van Ost decided that the only way he could control the quality of the boats in his fleet was to manufacture them himself. CSY management refined their designs through client questionnaires and dialogue with charter captains, yacht charter managers and dock masters to compete with rival charter fleets of Morgan Out Islands, Gulfstars and Irwin yachts. 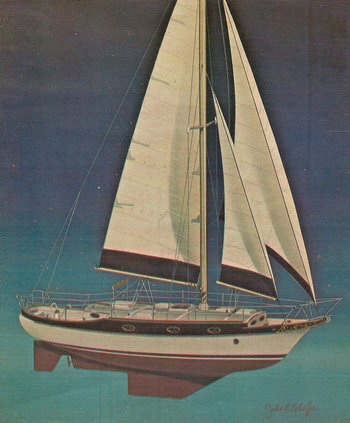 The result was a roomy and robust sailboat with emphasis on structural integrity, and designed for the boisterous tradewinds of the Caribbean. The new boat and sail plan well outperformed other boats of a similar size. 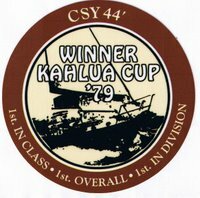 In 1979, a CSY 44 won overall honors in the Kahlua Cup race sponsored by the St. Pete Yacht Club. In their heyday, CSY turned out one boat each workday, and produced in the neighborhood of 400 vessels, with approximately 185 boats in the charter fleet. CSY Yachts manufactured a few powerboats, but the vast majority were sailboats; a 33-foot, 37-foot and three versions of a 44-foot, a walkover, walkthrough and pilot house. The walkthrough was added to the line after prospective owners clamoured for an “owner’s model” with specific additional features. The walkthrough and pilot house versions sold at a premium over the walkover model designed for the charter business. No part that comes from the mold can be better than the mold itself. It is a truism. And by the same token, no mold can be better than the “plug” from which it was made. Here is the sequence. From the finished architect’s drawing board comes the finished yacht design from which an exact full scale model or “plug” is built. Months go into its preparation. Every mark, every unevenness must be sanded and buffed until a perfectly smooth high gloss finish is achieved. There can only be one criterion in this stage–the best! Hang the cost–for everything that comes after is only as good as what is done now. Then and only then is the mold begun. Over the waxed plug there is created layer upon careful layer of fiberglass to create the mold. 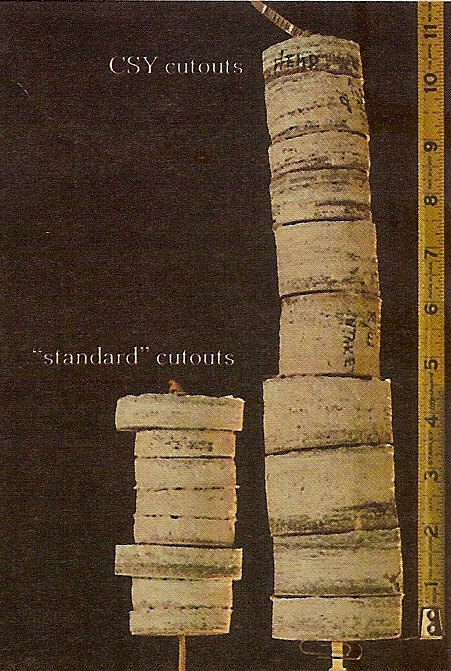 To avoid distortion in the final product, each layer must harden and cure for a specific period of time and then carefully be ground and sanded. Then a welded steel framework is glassed into place. Now the mold is ready to begin turning out parts. The more perfect it is, the more perfect will be the parts it produces. In order to carry out this whole process it takes many months and the tender loving care of a very cranky yankee who won’t let us stop or hurry up any part of the process until it is exactly right. The first layer to go into the mold is the gel coat. There are 2 types of gel coat, organic and inorganic. The latter, which CSY uses, is 1/3 more expensive. It dries harder, and it holds its color and high gloss longer. It’s so easy for a manufacturer to skimp here, but you won’t discover it for at least a couple of years. The gel coat is laid down carefully from 18 to 25 thousandths of an inch thick. If it is too thick it will cure unevenly. If it is too thin, it will ‘craze’ or ‘alligator’. Care and precision are essential, as in every other part of the production of anything, including a boat. At the CSY Yacht Corporation, we use twice the number of layers of mat and roving than is recognized by the industry as an “adequate” layup. At the turn of the bilge, our layup approaches two inches. Why so thick? For that once-in-a-lifetime moment when a stronger hull can save the boat–and your life. A hull is the foundation of a boat, the same as it is with a house. A thick hull is a strong foundation which translates into bulkheads, doors and engine beds that don’t shift, and always fit. Guidelines set by the Society of Naval Architects consider an acceptable flexural strength for a fiberglass hull to be between 25 and 20 thousand pounds per square inch (psi). CSY’s hulls test to an average of almost 36 thousand psi because of the time and care and additional materials that go into the layup. The decking on all CSY yachts is solid glass laid up to the thickness of most hulls. This is a great deal stronger than any sandwich type construction of balsa or foam or plywood squares. Exceptionally durable. It won’t rot, it won’t mildew, it won’t leak. Joining the deck to the hull is a crucial operation because no matter how durable both pieces are, if the joint is weak or improperly prepared, you’re in for trouble. What has to be remember about a hull-to-deck joint is that it has to 1. be flexible. 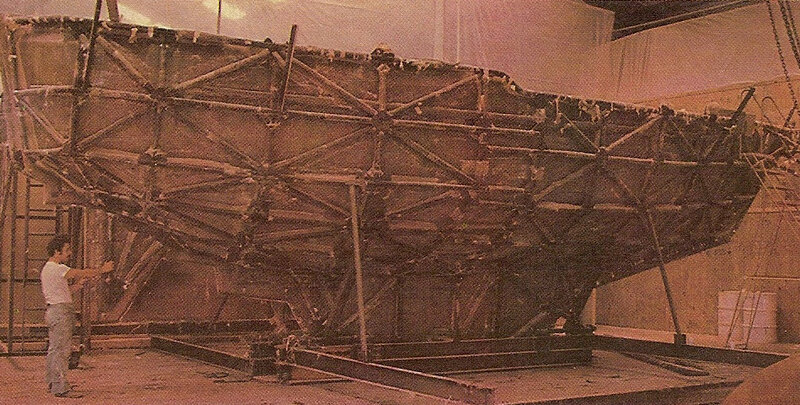 2. it has to have a mechanical hold to keep the deck and the hull together as the flexural stresses of each differ. 3. if possible and most important is that the joint can accommodate 1. and 2. and still keep your boat together, forever, and still keep the boat dry. Here is how CSY does it. First a flexible sealant, 5200 by 3M, is placed in the joint when the deck is placed on the hull. Then #4 stainless steel screws are set every 8 inches to keep the alignment of the deck and the hull. Next, heavy 5/16″ stainless steel bolts with lock washers and nuts, secure the deck to the hull on 8″ center. Over this a teak toe rail is placed which is also screwed through the joint every 12 inches. If there is a better hull-deck bond in the industry, we don’t know about it. Hatches: All CSY decks are designed with high 4″ coamings to receive all hatches. Then we build heavy hatches, which rest on gaskets on top of the coamings to make a seal. Even if the gasket doesn’t seal or deteriorates, there has to be 4 inches of standing water on the deck before a leak can begin, even if the hatch is not dogged down! Our boats are built on nine stations with four days on each station. At the end of each day, there is a quality inspection to assure everything is being done to our standards. Then when the boat is ready to go out the door, it is held up for an entire day for it’s final pre-launch inspection. At CSY we’re old fashioned. At this state, back in the good old days, the owner would conduct his own “Owners Trial” or “Acceptance Trial”, taking the boat out, subjecting it to his own scrutiny and returning with any criticisms he had for correction. Unlike most other manufacturers, we don’t buy because of price. We buy the best, regardless of price. Edson steering systems are standard aboard all cSY yachts. Edson uses stainless steel chains as a driving mechanism, and then it changes over to wire around sheaves to a quadrant attached to the rudder post. CSY extends the rudder post and machiens the top of it so an emergency tiller can be attached if one of the steering cables should let go. Edson equipment uses steel needle bearings which give a smooth, good “feel” in steering. For the wheel we prefer the Edson smooth, all stainless steel destroyer wheel because it is corrosion proof and trouble-free. But the final and most cruicial step is in the design and the care in the installation of the system. Good storage can make or break a boat for whoever has the job of keeping things neat below. Here are just some of the storage facilities aboard all CSY yachts. For each one on boat: 12″-18″ of linear space in the hanging lockers, 2 large bunk-sized drawers, a private drawer in the head, bunk-side shelves. For keeping things together–dry storage for bedclothes and pillows, instrument, book and chart storage, clothes hampers in each head, extra linen storage, dry shoe storage, tool storage drawer, odds and ends drawer, 4 or 5 galley drawers, space under the sink for storage, a pots and pans locker, dish locker, a glasses and bowls locker, bug and odor-free garbage storage. Spice rack, liquor cabinet, cockpit cubbyholes (for winch handles, etc) Bib, big sail lockers to hold extra sails, fenders, cushions, lines, outboard, anchors, everything. An on-deck ‘dirty’ locker. A beer cooler next to the helmsman in the cockpit. Vented propane storage (3 month supply). Split anchor rode storage (250′ of line plus chain per bin). There is room aboard to store 3 full weeks of provisions (3 weeks of perishables, 3 weeks worth of ice, 3 weeks of frozen food–in a mechanical refrigerator. The list goes on and one. Planning ample storage means a comfortable home afloat. Without proper ventilation and dry design, mildew and moisture can make your life miserable. “Proper” ventilation doesn’t mean “adequate” ventilation, but super ventilation. There isn’t an enclosed space on any of our yachts that can’t have both opening ports and one or more overhead hatches in addition to companionways. Count the possibilities for opening hatches and opening ports on any CSY yacht and compare with any yacht you may be contemplating. There is no comparison. All CSY yachts are designed to be lived aboard for long periods of time. Even forever, in comfort and privacy. Just what is comfort aboard a yacht? 6″ cushions instead of the usual 3″ or 4″ ones. Hatches with high lips, means a dry boat. Can you think of anything more important? Oversized beds, not bunks, designed fore and aft, not athwartships. A minimum of 6’4″ headroom, going to 6’7″. A slow running diesel, insulated and out of the living areas, with a quiet exhaust system. A large, convenient, safe galley. Big heads. Ample showers with hot and cold pressure water. Fuel and water tankage so you don’t have to worry about it for weeks at a time. Broad and uncluttered decks. Battery condition guages. An electric windlass for hauling in the anchor. A circuit breaker panel for all electrics. An electric bilge pump backed by a big hand pump that doesn’t require the endurance of Charles Atlas to pump it. Liveability, in short, comfort, is one of the things that makes you really love your boat. She’s designed and built to live aboard for extended periods away from any base of supply. A totally accessible engine area is fundamental–so the engine can be easily worked on or removed without tearing the boat apart. Lets face it. As the world’s largest charter boat organization, we have to care about maintenance. And we build for it. We have stated many times our preference of no walk-through in the mid-cockpit configuration, and have so stated in our book, the CSY Guide to Buying a Yacht, with our reasons. However, we aren’t everybody and everybody should have a choice. Heretofore, we have only offered the alternative. Now we offer the choice of a walk-through model which corrects what we object to the most in a walk-through, an ugly, ungainly boat. The CSY 44 Walk-Through sails well. We know that because she is built on exactly the same proven hull as our other CSY 44 models. She is built to the same heavy specifications as her sister, with bronze ports, bronze hardware below, stainless steel propane stoves, stainless steel hardware on deck, extra-heavy rigging, and the Perkins 4-154 diesel–everything that places a CSY yacht head and shoulders above any other yacht. Jack Van Ost, a New Jersey dentist, father of eight and pioneer in yacht chartering, has died in Sun City Center, Fla., at the age of 83. Van Ost, founder of Caribbean Sailing Yachts, opened one of the first Caribbean charter bases, operating first out of Red Hook, USVI, then Tortola, BVI a year later. CSY started its first winter charter season in 1967 with 16 Chris-Craft Capri 30s. At its height in 1981, the company was chartering 186 sailboats from bases in the Florida Keys, Roatan in Honduras, the Bahamas, Tortola and St. Vincent in the Grenadines. He introduced many innovations now common in yacht chartering: standardized and easy-to-maintain fleets, boats designed for charter, provisioning, owner lease-back programs, a sailing school, a manual to familiarize customers with boat systems and cruising grounds, and a system for qualifying clients to charter a boat. Van Ost conceived the idea of a charter fleet made up of identical boats — uniformly maintained and equipped and operated from a base with a marina (and later a small hotel) — after a particularly memorable Bahamas charter. In 1976 Van Ost and his team designed with Peter Schmitt the CSY 44, a boat Van Ost wanted to be the ultimate cruising boat — tough, fast, comfortable, seaworthy — the culmination of all he’d learned about the demands of cruising. Thirty years later it still is considered one of the great cruising boats, but the design led to a decision that would ultimately sink CSY. Unable to find a builder who could produce a boat of sufficient quality at the price he wanted, Van Ost decided to build the boat himself in Tampa. CSY quickly became the sixth-largest sailboat builder in the country, building 400 boats from 1977-’81, but Robert Van Ost said a one-two punch of 20-percent interest rates and a half-million-dollar deficit at the outset of the venture dogged it to the end. CSY Yacht Corp. sucked so much money out of the charter business that it never recovered, Robert Van Ost said. The boat building operation closed in 1981, and 10 years later the charter company closed, handing over its remaining bookings to The Moorings, he said.